Majority of people who are camping for the first time want protection which comes with having one more person with them in the tent and that’s absolutely okay. While experienced hikers, having experience of living in woods and who are in search of a peaceful solitude which can be only obtained there, choose solo tents. One person tents are made to provide ultimate efficiency, can easily fit in your backpack, and can be carried anywhere for days without wearing out. One person tents or solo tents can be set up easily and these tents protect you just like a full-size tent. If you are camping alone, then you will need a tent which provides you a peaceful sleep at night. There are a lot of tents available in the market, hence you may find difficulty in selecting the best tent. The primary thing which you should look for is for what purpose you will use a tent and what is your budget. 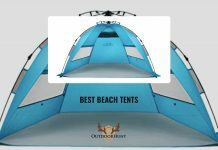 In order to resolve your issue, here we will provide you with the list of Best One Person Tents 2019. 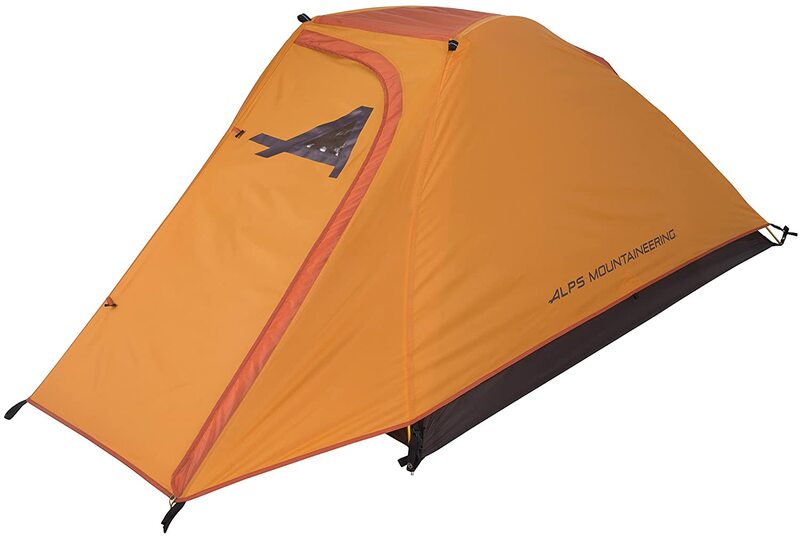 Alps Mountaineering is building some of the best one person tents in the market. The tent features a stylish look and a narrow dome which is free standing. The tent is built from 75D Poly Taffeta Floor, 75D Polyester Fly and half mesh walls to provide the best ventilation. Here, seams are sealed and a floor is coated in order to protect you from extreme weather conditions. The tent weighs less than 4 pounds and it is long enough upto 90 inches, hence it can occupy anyone. The rainfly can be tied down on the corners and it consists of flexible tension straps. During the rainy season, you should set up the rainfly first and then the tent so that your tent remains dry. Apart from the above features, it also provides 8 zippers, strong pockets, gear loft, stakes, guy ropes, and one doorway. Zippers available on the door and vestibules are built from great quality. Large vestibule can be used to store a lot of things. Eureka Midori is one of the best one person backpacking tent in 2019. This tent is waterproof and is suitable for the solo trek into the woods. Despite being a one-person tent, it provides a lot of space for sleeping. The tent also provides loft, hence you can easily store anything you want. The tent features a bathtub style coated floor which prevents water to enter inside the tent. The tent also consists of a neat technology which Eureka refers to V3. V3 means that the firm focuses on the three most essential things of the tent which include volume, versatility, and ventilation. The big doors and windows provide better airflow and an additional strut pole help you to expand the available space. 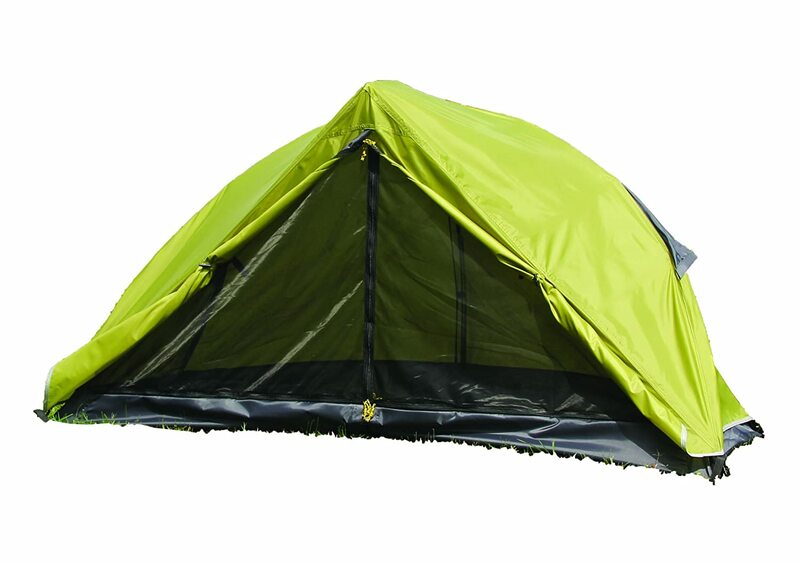 Last but not least, the tent features a lightweight design and its weight is just 3.9pounds. Alps Mountaineering Zephyr falls under our list of best one person tents 2019. 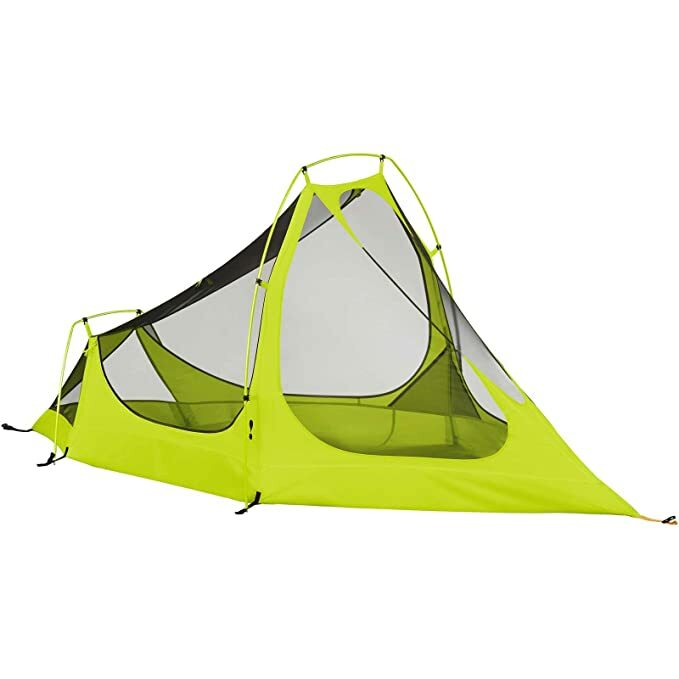 This tent offers a unique design which is fully stable along with the thing which a majority of solo tents in the market doesn’t offer, which is headroom. The tent is free-standing and consists of aluminum pole design which can be setup within a few minutes. In this tent, you can stand along, read a book easily or store your items. The tent provides a lot of ventilation, a big gear loft, factory sealed fly and floor and a big vestibule where you can keep your boots or anything you want. When you lift the tent up, you will be able to see how the designers have directed to make such a big headroom out of this much fabric. The tent resists water and UV damage along with adding some vestibule for extra storage. It consists of 8-zippers, mesh storage pockets, gear loft, aluminum stakes, and guy ropes. Its minimum weight is just 3 lbs. oz. and this tent is best suited for a single person. Teton Sports Outfitter is best for anyone who likes to enjoy the comforts of home even if they are in the forest. 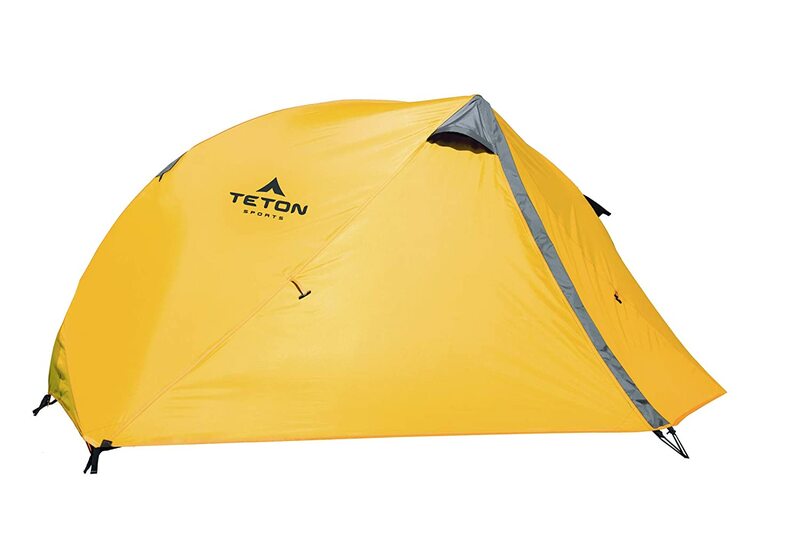 This tent made to slip right of the Teton cots, enabling you to sleep up off the ground. Setting up this tent is easy, you have to roll it out, lock your poles, pull the drawstring and tent pops up. Also, it consists of “two finger” collapse to make sure that it packs up easily. The tent is highly durable as it consists of solid taffeta and micro mesh inner tent along with a normal waterproof rainfly. The tent’s full-mesh top enables you to make a perfect stargazing experience. Hence, this is the best one-person tent for hunting as well as camping. One drawback is that the weight of the tent is 4.3 lbs. which more as compared to other tents in the market and tent is somewhat smaller. 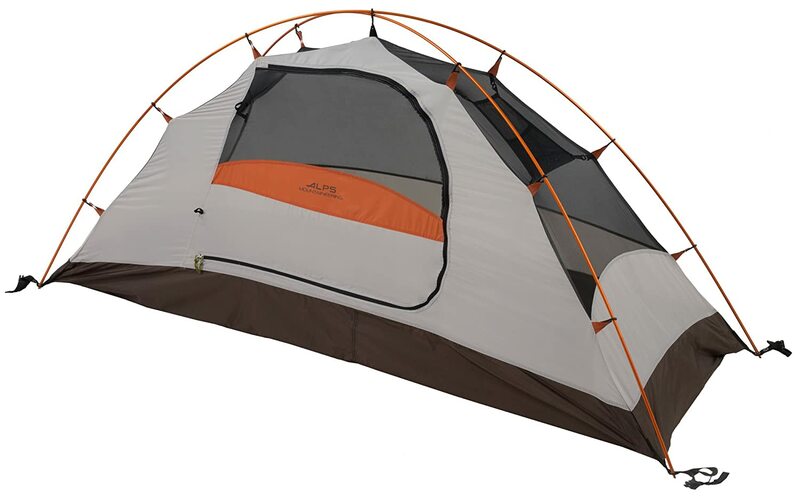 But, this tent provides complete comfort and comes with a lifetime limited warranty. First Gear clip hanger features a free-standing dome design. The weight of the tent is 3.5lbs and height is 43inch. Thus, it is lightweight and simple to setup. The tent features a complete ‘no-see-uh’ mesh, speed clips and 1500mm ripstop polyurethane coated150D oxford floor for extra protection. It also protects from any kind of bug or insects. The tent features a full taffeta rain-fly including taped seams. The rainfly is made using 1000mm polyurethane coating two air vents for complete ventilation while you sleep. The fly creates a great vestibule which can be used to store any type of gear at night. The tent is quick and easy-to-setup. The center height of the tent is more as compared to other tents, hence it is suitable for sitting up. The packages consist of things like fiberglass poles, aluminum stakes, and stuff sack. The tent has a lot of space and provides great ventilation. Also, it features a lot of headroom for sitting up comfortably. It also consists of a gear loft. 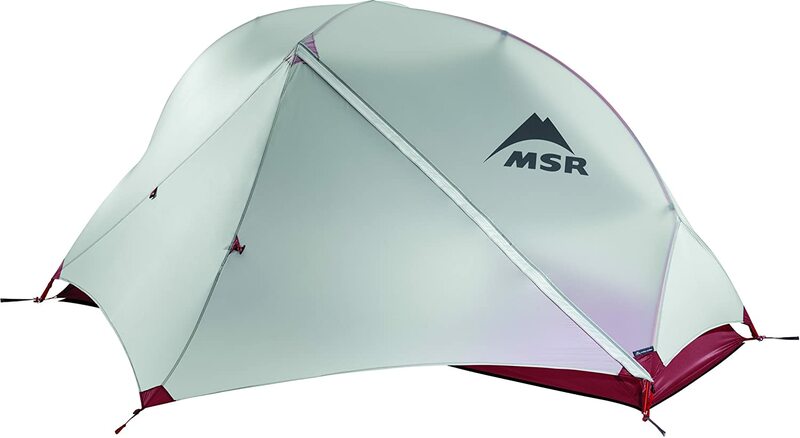 MSR Hubba NX tent consists of a ‘space age’ look which is liked by a lot of people. The tent provides a lot of space, hence you will be able to store a lot of things. It is lightweight, built from 40D ripstop nylon factory-sealed floor, silicon-coated waterproof rainfly and the when folded its super light, thus saving room in your backpack. The tent features a 9-square foot of vestibule and 3 feet of vertical space at the center, hence you will be able to setup without hitting your head. The 40D floor has is lightweight hence you will need to use a ground sheet. It also consists of a unified hub and pole system including color-coded clips, hence you can easily setup the tent. Lastly, it also consists of compact comprehension stuff/sack. Winterial Single Person Tent is a lightweight one-person tent with some extra waterproofing. It is basically a two-hoop easy to assemble bivy tent. It is lightweight and one of the best one person tent available in the market. The tent features a ventilated roof mesh with ultimate coverage to protect in a rainy season. Also, it helps to fight condensation inside the tent. When you pack the tent, it’s size reduces to 18x4x4 inches, however, it opens up to huge 90x38x28inches. You can easily setup the tent with the help of just two aluminum poles. The tent features a huge zippered door, 3 bundles of rope and 14 heavy duty stakes to properly secure the tent. The tent is lightweight having the weight of just 2.9lbs. This tent is suitable during summer and windy season. It is best suited for both campings as well as hiking. Teton Sports is well-known for developing different outdoor gears for a long time. Out of which, Mountain Ultra Solo Tent is one of the best one-person tents available in the market. The price of this tent is high as compared to other tents in the market. But in return, you will get a tent built from strong materials and provides good durability. The tent consists of huge micro-mesh windows so that you can enjoy good ventilation. A waterproof bathtub floor to resist water from entering inside, a unique design which just uses a single pole, which is quick to set up and pack up. The tent features a free-standing dome design, hence you can setup the tent anywhere you want. It features a footprint which protects the tent floor, heat taped seams, and anchor joints, a two-door tent for quick rolling and 2-way zippers. 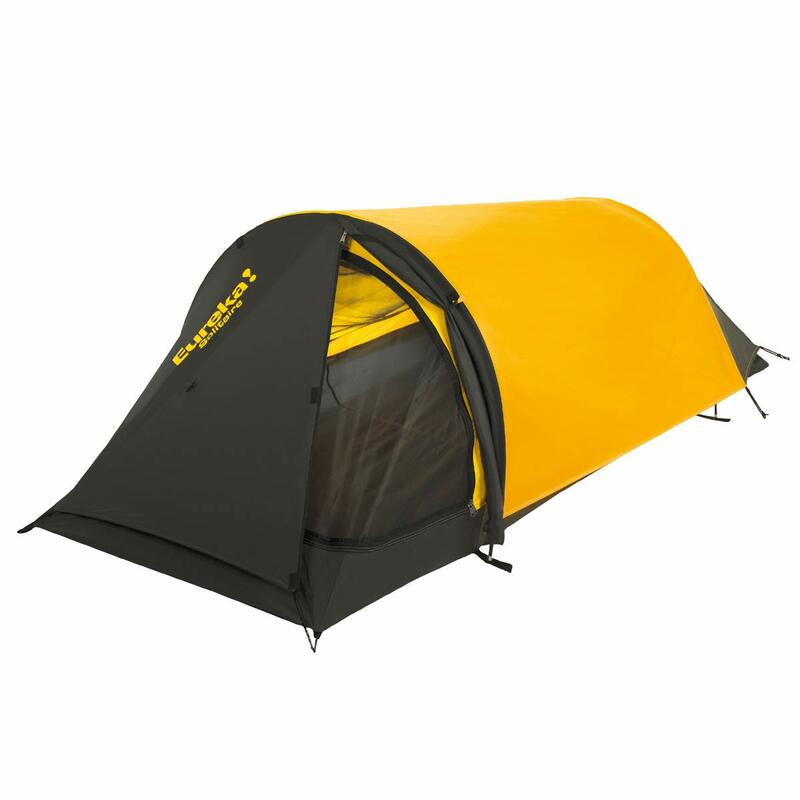 Texsport Saguaro is a huge 92inches long tent, hence you will be able to spread your legs properly. It just weights 4 pounds despite being made from polyurethane. Also, silver coatings on the tent protect you from UV rays and the rain. The tent features an arch style door with no-see-um mesh window, zippered storm flap, and quality taffeta walls and rainfly. The tent is designed in a way that two persons can easily sleep inside the tent. The whole roof of the tent is built from no-see-um mesh window; hence this will protect you from insects and also various allow you to stargaze at night. The firm is developing recreational products for the last 40 years and it is well-known for developing the best hammocks and hammock stand tents. The tent consists of a two-pole frame system with shock-corded fiberglass poles. Texsport’s tagline is “Authentic Adventure Gear” and we are sure that the firm works as per its tagline. 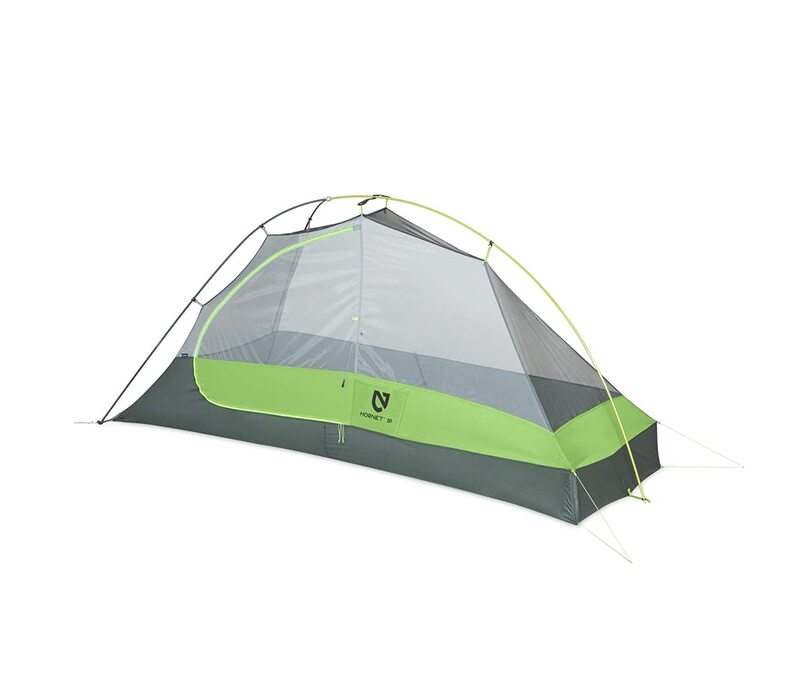 If you are looking for a huge one-person tent under $50, then go with this tent. 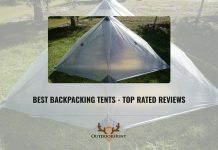 Listing Best one person tent reviews and not mentioning Eureka Spitfire 1 is not fair. 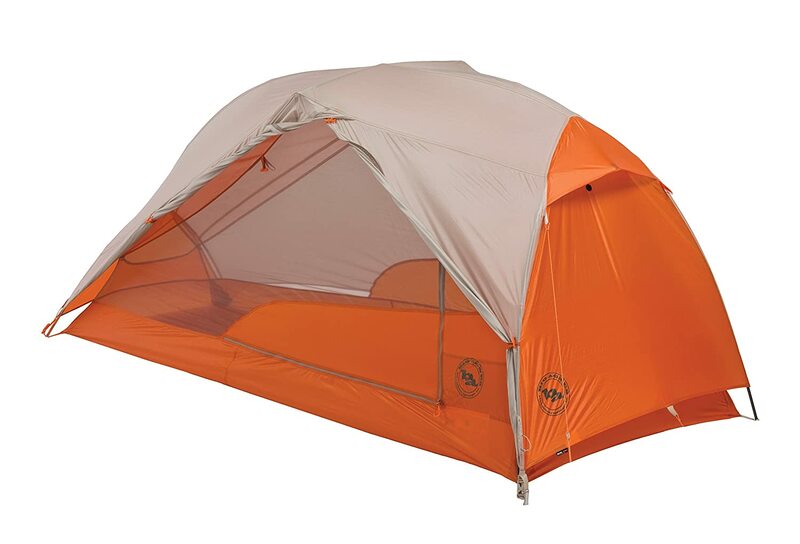 It is basically a double-wall tent with mesh for awesome ventilation with great headroom and extra interior space. It consists of a big bathtub floor with taped seams resist rain along with internal pockets offer gear storage. The tent’s hoop style aluminum poles lock into the corner holes easily and it just needs 2 stakes in order to set up the tent properly. The large doors make it easy for getting in and out of the tent. The rain vestibule enables you to store your gear. The roof provides enough ventilation and also allows you to do stargazing at night. This tent is suitable for anyone who is less than 6 feet as the diamond-shaped interior space isn’t completely used as an interior space. However, the tent is comfortable and extremely durable. 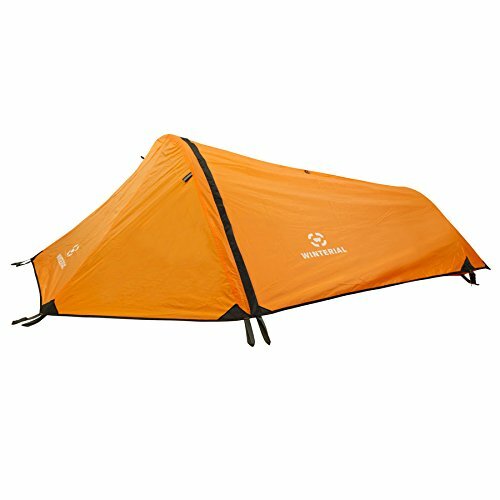 Big Agnes Copper Spur HV UL is a complete combination of weight, interior space, and functionality. The tent is ultralight but yet offers a lot of storage where you can easily store all your gear essentials. The tent features a 4-way high volume hub design which raises is rigidity by 25% and increase usable volume by 20% as compared to the previous versions of the model. 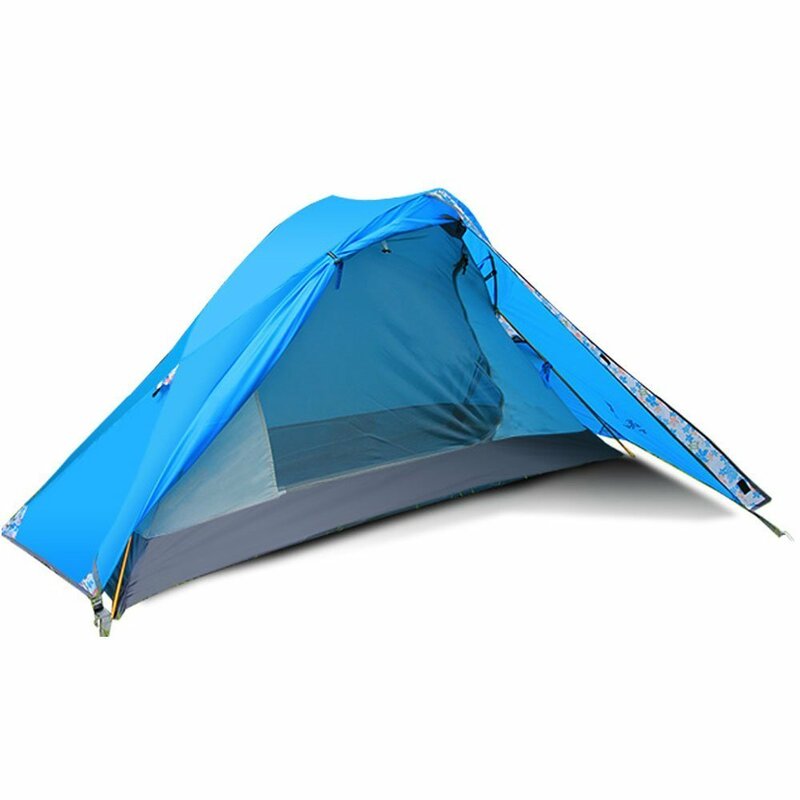 Tent body has a great design which consists of random rip-stop nylon breathable and polyester mesh. 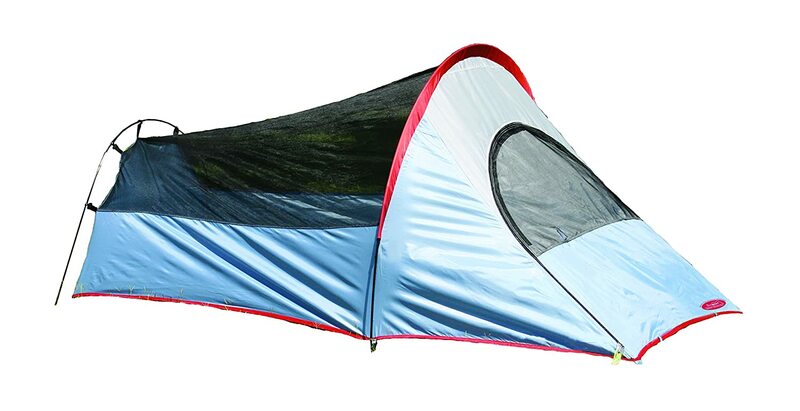 The weight of this tent is just 1.8lbs and its height is 6inches. 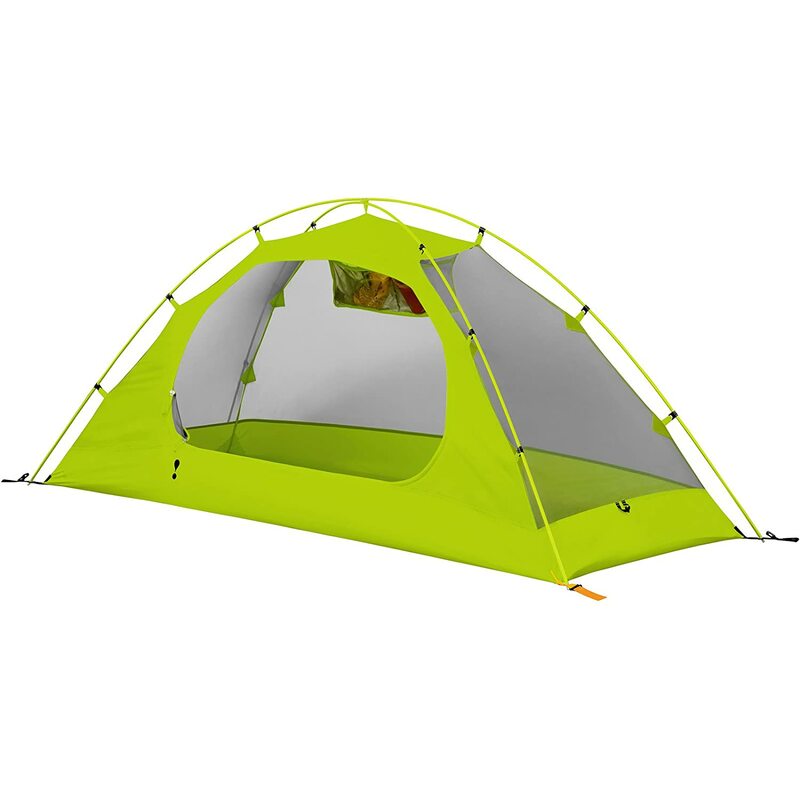 This tent is suitable for any kind of small or big adventures. This tent falls under the list of best one person tents 2019. The tent is designed in a way that it is too easy to setup and also remains stable in bad weather conditions. Despite being narrow, the tent consists of 40inches of headroom. It is a 3-4 season tent; hence you can use it in the heavy snowy day also. Flytop Single Person tent is lightweight and made using 210T polyester in the floor which is factory coated with 300mm of PU waterproofing. The tent includes ventilation which offers good air circulation for breathing and also consists of a mesh pocket where you will be able to store all your valuables while your sleep. Its weight is 3.6 lbs. and its size is 82inches, hence it is big enough to accommodate any person. It is waterproof; hence it keeps the moisture outside. The package consists of extremely durable aircraft grade aluminum poles and rainfly to resist water for coming inside the tent. 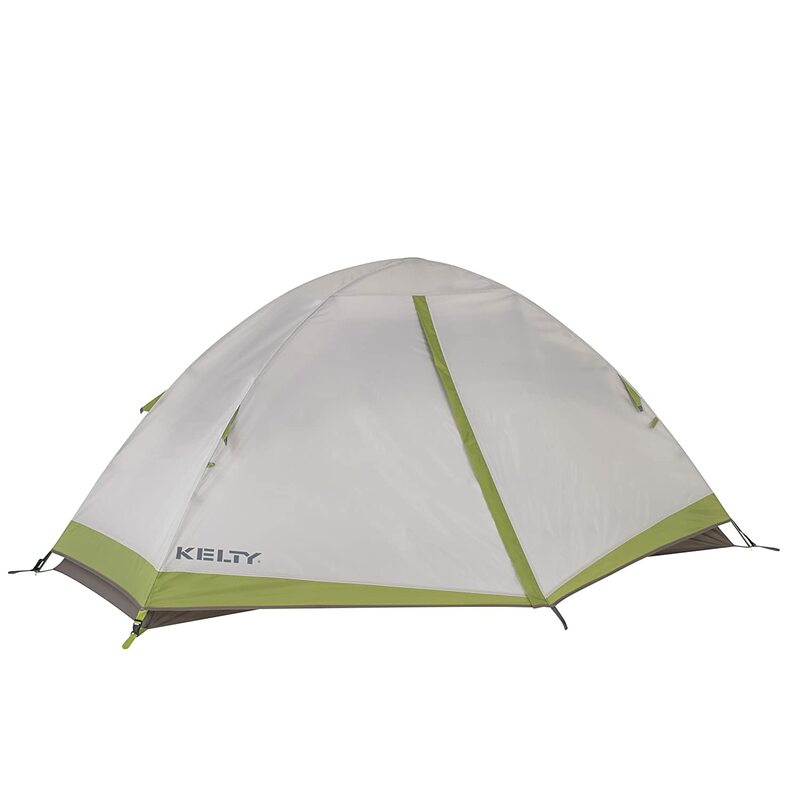 While listing best one person tent reviews, Kelty is one of the most popular firms in developing recreational products. If you are a beginner or you don’t want to spend much on the tent, then Kelty Salida is the best one person tent available in the market. Even though the tent is available at an affordable price, it doesn’t compromise on the features. In this tent, the wall material is built from 68D polyester, 40D No-See-um-mesh. While the Floor material is built from 68D Nylon. As it is built from these materials, it provides great durability and comfort. The tent is easy to setup as it consists of compact folding poles, gearloft loops, color-coded clip and fly attachment. The Kelty Salida is a lightweight camping tent which consists of 6 sq. ft. of vestibule space and a big interior which provides hikers great comfort. The tent is designed for 3 seasons, consist of 1 vestibule, 1 door, and two poles. The tent consists of fully seam taped construction, hence it will protect from any bugs and internal storage pockets and will allow you to store anything you want. This tent is ideal for backpacking trips. Eureka Solitaire is one of the best solitaire tent available in the market. The wall of the tent is built using 50D no-see-um mesh in order to provide the best ventilation. The tent consists of rainfly and a floor which is built from 75D polyester with 1200mm fabric coating for best resistance to rain. The tent provides a lot of things for storage such as internal pockets, flashlight loop and a vestibule for storing your gear. The tent includes a mesh roof for stargazing and also a roof which is zippered for an extra exit as well. The rainfly provides complete coverage and attached for more deployment. The poles are built from an elastic cord and fit into the sleeves for quick setup. It is not a freestanding tent; hence it requires guylines to stakes in order to make it stable. Eureka Solitaire is a bivy-style three season tent with a weight of 2 pounds and 9 ounces and it covers an area of 21.5 square feet. It features a zippered top for getting in and out of the tent easily. Eureka started developing camping gears since 1895 and still now it is one of the most popular brands in the industry. If you are looking for a tent which provides great shelter along with great volume, then go with Nemo Hornet. Nemo Hornet is a lightweight double-wall tent with a side entrance and a big vestibule for storing anything you want. Best quality shelf fabrics with a minimum pole structure, patent-pending Flybar volumizing clip provides more space without increasing the weight. The humble pole structure provides quick setup along with great ventilation between the inner tent and also a rainfly which helps to reduce tent condensation. Here, reflective guy outs and corner struts provide more volume at the foot, preventing sleeping bags from tent wall condensation. Aerodynamic vents increase air circulation for breathability and the high bathtub floor prevents cold wind to enter inside the tent. The mesh on the tent sides provides more privacy and the black ceiling mesh is virtually transparent can be used for stargazing. During backpacking, the weight of your pack and the tent is directly proportional to the size, physical location, and the hiking terrain. One condition which you will read in many places, i.e. the weight of your pack should be 16 to 18% of body weight. The weight of each and every person is different, hence it is important to check the weight of the pack and carry accordingly. Thus, when you are planning to purchase a tent, you should check what percentage of weight your tent can hold. The three heaviest items which you will carry on your back include tent, sleeping bag and your pack. Tent fabric is generally measured in deniers. Denier is dependent on the measurement of silk. One strand of silk is 9000 meters long and it weighs 1 gram. It is one denier. Thus, anytime it is mentioned 40 deniers, then it has filaments which are 40 times than the size of the silk strand, which is 40D. If denier count is more, then the product will be stronger and if it’s low, then the product will be cheaper. The seasonality of your tent is dependent on the seasons and the regions in which you want to hike and camp. It depends on the weatherproofing and the waterproofing of the tent to keep you warm in various seasons and climates. During winter and heavy terrain, you will require a heavyweight tent. During summer, you can go with a lightweight tent. However, if you are going in a rain forest, you might require a rain flap. 2-Season: It is a lightweight tent used in good weather with a calm climate and little to no precipitation. The tent is generally made from mesh and lightweight materials. During summer, you will require good ventilation, hence mesh is necessary. The rainfly on this tent will be above the ground, thus allowing a tent to provide more cooling capability. 3-Season: It is somewhat heavier and useful in three seasons mainly spring, summer, and fall. It has ventilation flaps which can be closed and it protects from heavier rains and winds. Here, fabric, guy lines, and poles are built from solid material. Generally, rainfly will be closer to the ground to protect from heavier rains. 4-Season: These type of tents are constructed so well, that they can be used for all the seasons. Hence, this tent will be light for summer and heavy for winter. Primarily, two separate tents are setup jointly, one inside the other, especially in winter climate with snow and heavy winds. During summer, you will just require the inner tent in order to maintain coolness and ventilation. During spring, you will utilize only the outer tent due to more precipitation. Tent Poles are built from fiberglass, aluminum or carbon fiber. Aluminum is extremely durable as compared to the other three. However, Carbon Fiber is used in the production of high-end tents where their main purpose is to make tent lightweight. Fiberglass poles are not durable at all and break regularly. Therefore, we don’t suggest to buy a tent with fiberglass poles. Majority of makers who sell trekking pole tent provide regular tent poles by means of add-on-purchase. In a freestanding tent, there is a system of poles and gear which hold the tent properly without any external guidelines. Hence, these are part of the internal structure of the tent. In these tents, the poles are mainly covered with the rainfly and are mostly invisible from outside when the fly is placed. Usually, freestanding tents are heavier as compared to the non-freestanding tent because of poles. These tents are costly as they are required to be setup properly and also they break down easily. Non-freestanding tents are referred to be the same as freestanding tents as they require poles to stay properly. While these tents utilize trekking poles, this simply means that you save weight because they don’t require special tent poles just like the freestanding tents. Non-freestanding tent needed to be staked down, they mainly have a single wall structure with no rainfly and by chance, you break the trekking pole, then it’s simple to replace. In general, most of the solo tents are freestanding tents. A backpacking tent which doesn’t protect you from elements is not useful at all. Hence, always be careful while selecting the best budget tent from the market. All the tents mentioned above provide solid protection in order to keep you safe, dry and warm. Backpacking tents usually keep weightless by limiting the interior space. Internal pockets are very much useful in a two-person tent. Internal pockets and gear loops are used to keep gear from the ceiling. Gear loft is another benefit. Vestibule space is an added benefit; thus, it consists of multiple doors, hence the gear storage doesn’t block entry and exit. All tent experience some kind of condensation. In order to avoid this, select a proper tentsize and ventilation. All the tents have a lot of mesh netting to improve airflow, high vents to remove moist year, and door-tie backups to fold tent doors and keep them open during the night. Majority of tents doesn’t include footprint with them. Currently, lightweight hikers are also considering footprint unessential. The main purpose of the footprint is to increase the durability to the floor of the tent. A footprint will protect your tent from resistance, thus will last longer and not require many repairs. If you don’t have any issue in carrying more weight for increasing life of then, then always carry a footprint same as the size of your tent. While searching for any tent, you may come across the term “Vestibule”. This might seem like a strong and terrific substance however it simply means a small patch of protected ground which is created by the fly extending out beyond the footprint of the tent near the door. Vestibule generally refers to a place where you can remove wet and dirty boots and also wet clothes before entering the tent, instead not all the vestibule provides this facility. This especially refers to a small, narrow and one-person tents just like all reviewed above. There are basically two types of vestibules: front and side. Front vestibules are available from the front door of the tent. These are normal round or square tents. As they are linked with the multi-person tents, the front is generally somewhat large. Several tents are too big to easily occupy a camping chair. Side vestibules are something which you will get on solo tents, just because there no other place to fit them. They are not big like front vestibule however they are big enough to enable easy access to the door along with providing space to store your gear. A rainfly is something which stops you from having to break camp and go home in case of rain. It is kept on the solo tent, to protect you from rain, wind, and snow. You will be urged to find a waterproof tent so the quality of your rainfly is essential. There are mainly two types of rainfly: partial coverage and full coverage. In the partial rainfly, there are some tents which cover the entire tent and there are those which are good enough to stop rain from entering via the mesh windows. A real full-size rainfly, by comparison, will cover the whole part of the tent and ensure that there is no part which is coming in direct contact with precipitation. A strong wind can spoil all your camping experience, simply as rain or snow hence when you divert it then it is a plus point. How long will one-person tent last? One-person tents are available in different shape and size and are built from different materials and used for different purposes. Any tent regardless of its size will last long if you take proper care of it. Some of the tents are used by climbers to reach the extreme peaks. Let’s have a closer look at the things which has a great impact on the lifespan of the tent. There is no substitute for a well-built tent. A poorly built tent will not be able to resist snow, wind, and rain for a long time. While the premium solo tents are built in a way to last long and consist of a solid, tear resistant fabrics, rock solid stitching, by all means, high-quality no-stick zippers, poles built using high-quality aluminum and waterproof floors. Here, quality materials and solid construction are the main elements in determining how long your tent will last. Secondly, your tent should be built for the purpose you are going to use. For example, if you use a 3-season tent in winter, then you will often feel uncomfortable, hence you might shorten the life of your tent. Secondly, in case you buy a one-person tent with a partial fly and use it in the rainy season, you will reduce its lifespan and make it worthless. It is one of the most essential things which will help you to increase the life of the solo tent. Cleaning it on daily basis, folding it properly, and storing it at a proper place will make sure that you get the most out of your one-person tent. – Store your hiking tent away from direct sunlight. Several people will be able to use their tent for 20 years while others won’t even be able to use it for 5 years. The only difference between the two is not constantly using the solo tent but not taking proper care of the solo tent. If you are a type of person who loves to go for hiking adventures often, then you know the value of a better one-person tent. All the tents which are made today are a combination of modern engineering and old materials. Hence they provide a stable, dry and warm environment, hence you are ready for hiking on the next day. 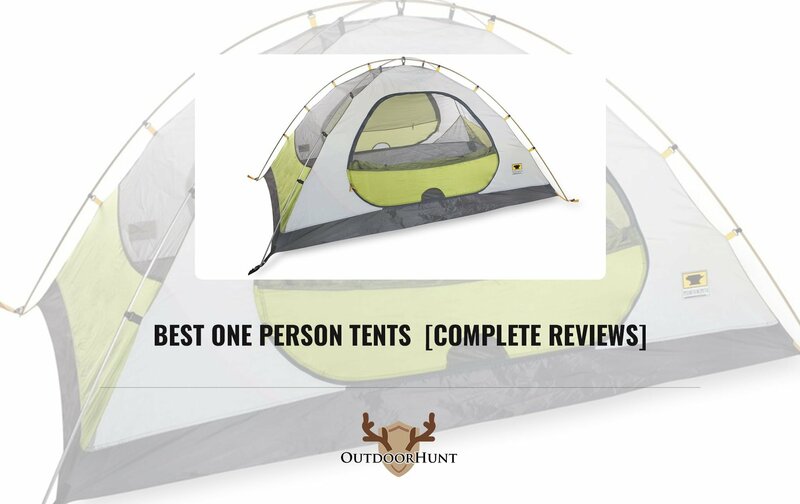 We hope that you like our best one person tent reviews. Also, by following the important factors which are given above, you are able to select the best one person tent 2019. Lastly, don’t forget to share this list with your friends and followers.